Here are some of the things that go into cabinets that do that. First is the construction material. In one sense, all cabinets are essentially “boxes” that accommodate shelving and/or drawers. Some manufacturers make those boxes out of plywood (usually ¾” thick) and then cover them with a veneer of maple or birch. Other manufacturers build their “boxes” out of particle board, which is considerably less expensive. You may never see the difference—at least at first—because both are covered with a veneer. But the particle board is much more susceptible to moisture, including humidity. It can swell and shrink. On top of that particle board can come apart more easily—especially at stress points such as where hardware is attached. You’ll pay more for plywood, but you’ll get a lot more durability. It’s also important to look at the drawers of your cabinets. Again, the insides of your drawers may not be visible at first glance, but they are items that receive constant use. Higher quality cabinets tend to have drawers that use a dovetail construction to hold the sides, front, and back of the drawer together. It’s a much more solid construction than simply stapling the parts together. Your drawers will stay square and slide much more smoothly—for a lot longer—if they’re built better. One additional thing to look for in semi-custom cabinets is flexibility and functionality. You want cabinets that fit your kitchen. With standard cabinets, you choose from standard dimensions and have to figure out how to make them work. Semi-custom cabinets offer more sizing (and finishing) options. If you need a narrow cabinet to take advantage of the most space in your kitchen, you won’t find it with standard sizing. You can probably find what you want/need with semi-custom cabinets. Where can you check out quality cabinets to find what you’re looking for? At Reed Design Build, we use Showcase Wood Products cabinets. 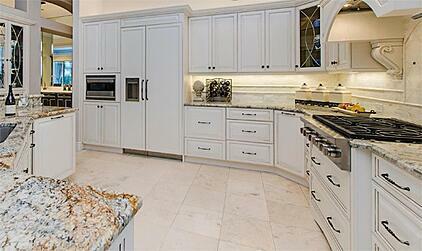 As a matter of fact, we’re the exclusive source for Showplace cabinetry in the Naples area. One reason is that each Showplace cabinet is made-to-order to fit your needs. Most cabinet sizes can be specified down to a sixteenth of an inch (with very few exceptions). This customization means you design your kitchen to fit your needs and then choose the cabinets to fit that plan—instead of having the cabinet dimensions determine your design. They offer a wide variety of styles and options. Click here to take a look through their gallery. As the exclusive local source, we can help you find just the right cabinetry for you Naples kitchen (or bathroom). And, for a limited time, we can help you save money with discounts on premium woods or cash back rebates. Click here for more information.